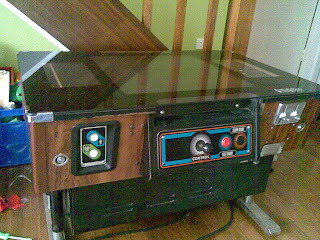 A friend of mine ('Striker') recently offered me cocktail arcade machine without a game board inside in exchange for fixing another cocktail cabinet machine. This is something I have wanted for years and never got around to building. The complete cabinet was a Godsend. After a steep learning curve and a trip with the screen to the local tv repair guy, thanks Horst, I was able to get Striker's machine going and then bought the parts for mine. 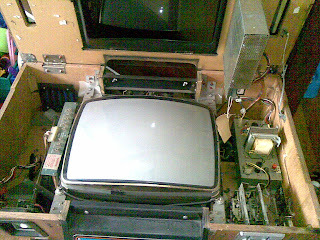 The cabinet is a Taito of about 1982 vintage. 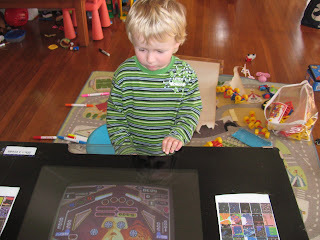 It has 2 player positions and an original 20" monitor that can be rotated to horizontal or vertical depending on the game board. I had to pick the 2 round locks (like laptop cable locks) to open the lid and the coin bin lock. This was actually quite fun. It was surprisingly easy after watching a few YouTube videos on the subject. I found the grand sum of $2 in twenty cent pieces. After a lot of inspection, googling for schematics and some advice from the Aussiearcade forums I started the rejuvenation, including removing old chewing gum. I cleaned up the mains power supply and removed the redundant wiring. I removed the switch mode supply as it was faulty. I installed a new power supply, new cable harness and the best part of all 60 in one game board. The connector on the original cable harness was quite unusual and could not be reused. I now have 60 classic games to play. I love it, the kids love it, even my wife likes to play it. The favorite at the moment is Pinball. Each player position only had one 'fire' button so I moved both buttons to one side, and added 2 new buttons to the other. 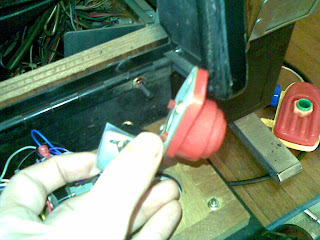 The new buttons work fine but don't fit quite right. I would like to keep the exterior original so I am looking for some 2 original and quite rare Taito buttons the same as this one pictured.